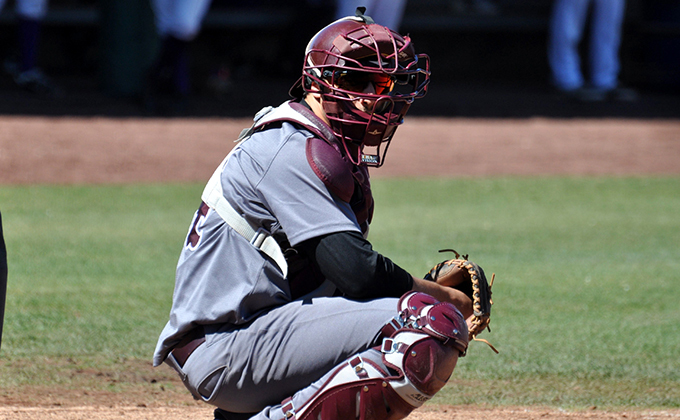 The San Diego Padres recently selected University of Redlands senior catcher Rainier Aguilar ’18 in the 33rd round of the Major League Baseball (MLB) draft. "I am so blessed and grateful for this opportunity," said Aguilar. "I am thankful for every single person in my life who has helped me get here, [including] my parents, my friends, and especially my coaches. I'm super thankful for what Coach Holley, Coach RG [Ryan Garcia], Coach Jerry, and all of the Bulldog baseball family have helped me achieve." Aguilar, who studied in U of R’s Johnston Center for Integrative Studies, is Redlands' first draft pick since Tom Bennett, who was selected by the Oakland Athletics in the eighth round of the 1995 draft. Head Baseball Coach Aaron Holley stated, "Rainier has had a great career here at Redlands and his hard work has culminated in an opportunity to play professional baseball. He was the American Baseball Coaches Association/Rawlings Gold Glove winner last year and our team MVP, and was a big part of the success we had as a team this year. Rainier will do a great job, and we know that he will represent the Bulldogs with class and character." Overall, the men’s baseball team had an outstanding season, becoming a California Intercollegiate Athletic Conference (SCIAC) co-champion. The team also set a single season record for games won, with 33 wins. Over the course of the 2018 campaign, Aguilar put up outstanding numbers while setting a Redlands single-season record with 22 doubles, which also places him fifth in National Collegiate Athletics Association (NCAA) Division III. He also finished the season with a .327 batting average and a team-leading 48 runs batted in (RBI), 56 hits, and 38 runs scored. Defensively, Aguilar threw out nine would-be base-stealers, racked up 292 putouts and 33 assists, and held a .972 fielding percentage. As a four-year Bulldog, he finished his outstanding career with 137 hits, including 39 doubles, for a batting average of .360. He knocked in 100 RBI and registered a slugging percentage of .509. While serving as Redlands' primary backstop throughout the latter part of his career, he recorded 592 putouts and 69 assists for an impressive .985 fielding percentage. With a quick release, he also fired down 22 attempted base-stealers. Aguilar's career at Redlands culminated in an All-America recognition, a pair of All-West Region honors, and two All-SCIAC awards, as well as being named the D3baseball.com's 2017 Gold Glove Catcher of the Year. At U of R’s Johnston Center, Aguilar’s emphasis of study was Justice and Law: Representation of "The Other."